I’ve been thinking about how to say this nicely. There is no way. GOOGLE is ripping off Lucinda’s. We now use what we call the OTA’s, Online Travel Agencies; Expedia, Trivago, Hotels.com Hotwire, Etc. 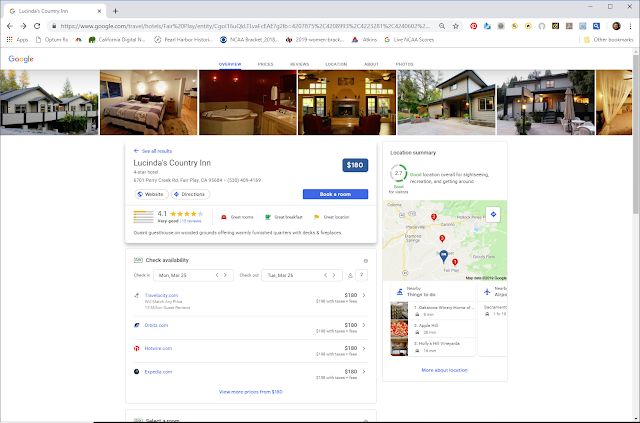 In order for Lucinda’s Country Inn to get a reservation through one of the OTA’s the public generally use GOOGLE with something like, places to stay in Fair Play. 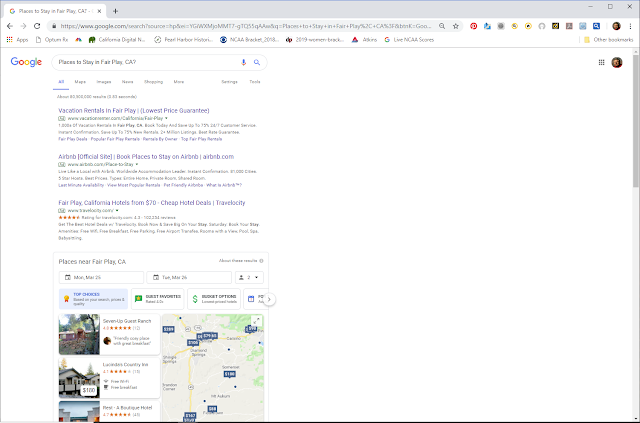 Then a whole host of places appear in the search results. (Figure One) Not Lucinda’s Country Inn, at least not until they scroll down to the bottom of the page. 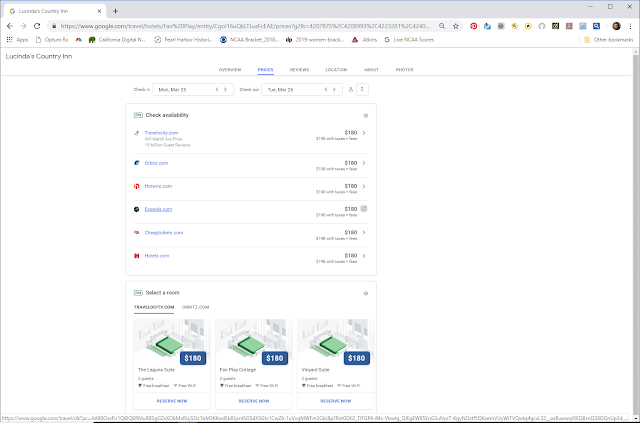 (Figure 5) GOOGLE has a “Four Pack” with four pictures and yes Lucinda’s PHOTO is one of them. (Figure 2) T he PHOTO is the only thing about Lucinda’s. All the other information in that “Four Pack” is information from the OTA’s listing for Lucinda’s. The OTA’s have gleaned most of their information from our website so it looks like our website. When someone clicks on the picture of Lucinda's you are taken to another page about Lucinda's, but not our website. 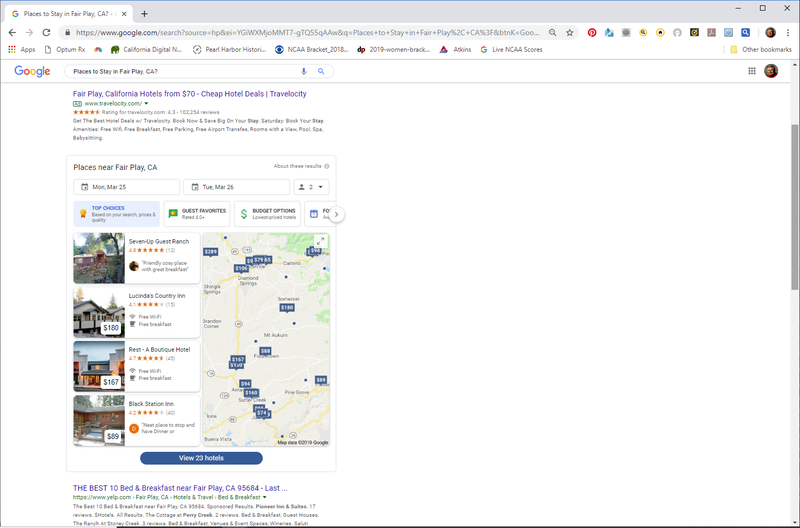 (Figure 3) When you click on the BOOK A ROOM BLUE BUTTON, you are taken to yet another page that has information about making a reservation, but it is not on Lucinda's website. (Figure 4) That is through the OTA’s not Lucinda’s website. So, GOOGLE is keeping people away from Lucinda’s Country Inn's website as long as possible so GOOGLE confuses the public and they make a reservation right then, thinking it is through Lucinda’s website; but it is NOT. Figure # 3: This looks like Lucinda's, but it's not our website. Figure # 4: This is a list of OTA's to make a reservation, NOT Lucinda's website. 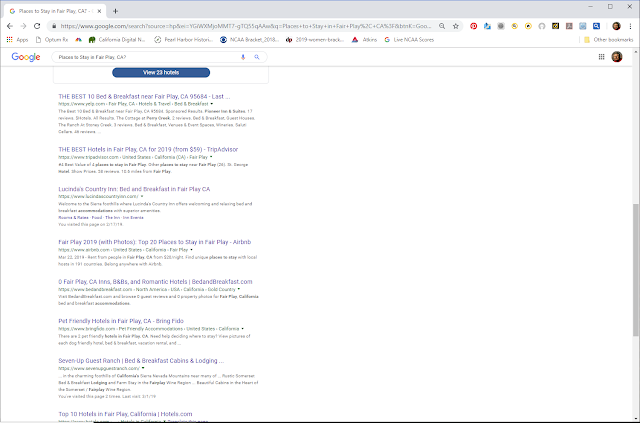 Figure # 5: The rest of the GOOGLE Search Results, “Organic”, are at the bottom of the page. Lucinda’s is the third one down and our website is there for you to click on. I won’t bore you with all the statistics about this scam, but about 75% of the people make their reservation as I just described thinking they are at Lucinda’s, or wherever, instead of on the websites of the OTA’s. But I will explain how the OTA's are not good for our guests. We have had guests that have stayed with us many times who can’t remember our website address and they GOOGLE "Where to stay in Far play?" and make a reservation through one of the OTA’s. The OTA’s cannot change their reservation once it is made and paid in full before arrival. That means if our guests want to modify their reservation, oh well, they can’t. One guest should have received their Friend's of Lucinda's free night, but we couldn't adjust their reservation, as it was an OTA reservation. Shortly they will get their free night when they come again. We don’t have access to the OTA information to make changes. If someone wants Champagne, Flowers or whatever in their suite upon arrival, the OTA’s cannot help make that happen. The guest has to contact us directly and that requires another completely different transaction. NOT CONVENIENT. That is not what we like to do for our guests. Here’s how GOOGLE is ripping us off, and the lodging industry in general. 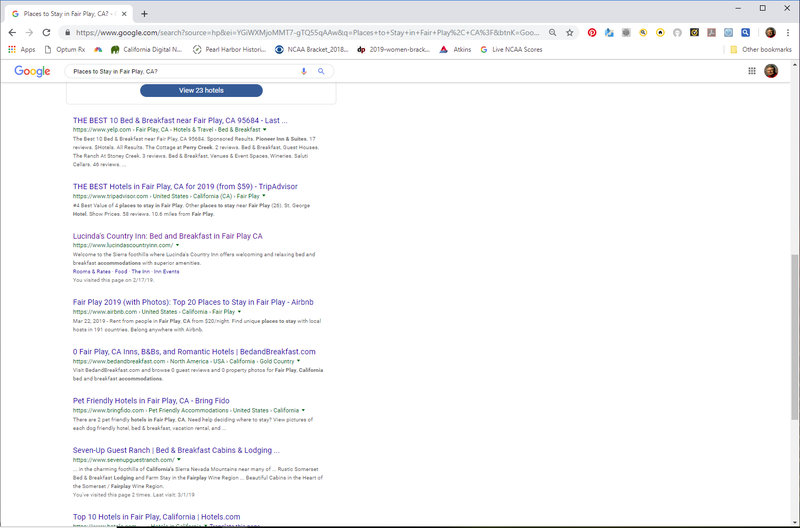 The OTA’s pay GOOGLE ad money to get placed in search results. That way the OTA’s appear well above and long before anyone sees Lucinda’s website address, so they can actually get to Lucinda’s website. When using the OTA’s, we pay them a commission, ranging from 15% to 20% for each reservation amount made though the OTA. That is how they are able to advertise on TV, GOOGLE, in magazines, and online via social media. Then they make their GOOGLE ad buys to get better results than us, even if we place ads on GOOGLE. Fair, NO!! Is this collusion? Unlike Trump’s constant denial, you bet that is collusion. OTA’s pay for their ads to appear before us, even our ads. The lodging industry, including the B&B’s, has launched a BOOK DIRECT campaign to let the public know that they should BOOK DIRECT with the places they want to stay. That way the guests will know exactly where they will be and that place will take care of them. I recommend you bookmark the places you frequent, in stead of using GOOGLE. That way you KNOW you are booking with Lucinda’s and if there needs to be modifications made, I can make them for you. If you want to enhance your stay you can pick those items you want at the time you make your reservation and you don’t have to go through the hassle of extra communication with me, to get those things you want. Bookmark your favorite places. BOOK DIRECT to save yourself some frustration.